Mike's posting of a convection event made me look for the source. This is from GOES 16, relatively new, .5km resolution, updated every 5 minutes. Select the "red" band which approximates the GOES West "visible". The new GOES 16 satellite imagery has great tools and higher resolution compared to the old GOES 15 satellite. 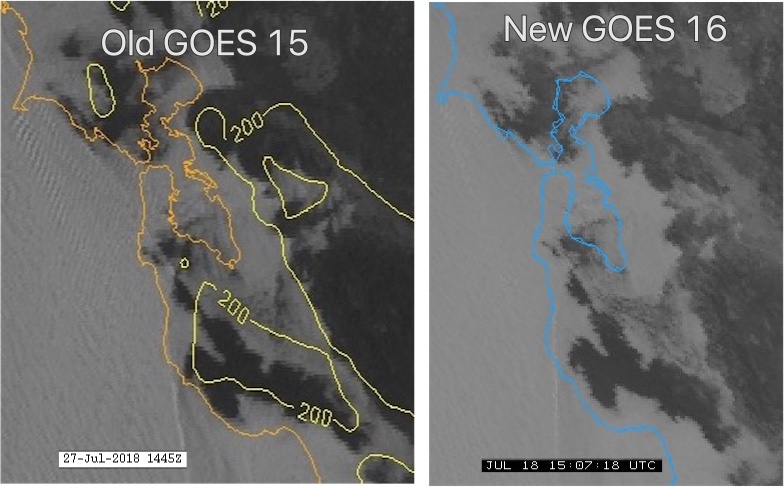 However, as you can see in the 2 images below from this morning, The Monterey NRL, through the years, has tweaked the GOES15 imagery for the Bay Area so that it provides more useful detail than the 16 does at this point. Looking at the 2 images below notice how the new GOES 16 does a better job resolving the edges of the fog. But the old NRL enhanced GOES 15 does a much better job showing the first hint of Año Nuevo clearing near Waddell. And it shows the wave clouds streaming from Pt. Reyes towards San Bruno Gap that foretells strong winds just aloft.